Highly detailed control-line model of Al Williams' Gulfhawk was made by Warren MacZura. Weighs 4 3/4 lbs., spans 36", in 1"-to-1' scale. Powered by throttled-35 engine. Wing area and size are about as small as practical without being a flying bomb. 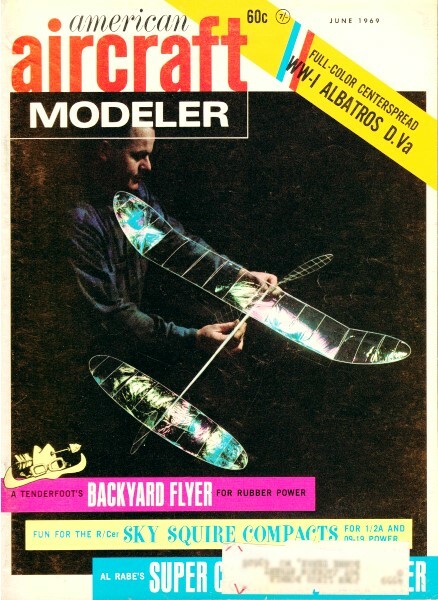 This plane won the first World Championships in control-line scale, was featured in American Aircraft Modeler Annual 1968. Pain-relieving scheme for scale modelers gives wing span and area in a flash! To Find Area: Multiply area of real plane (in sq. feet) by area factor in column D. Answer is area of model (in sq. inches). To Find Span: Multiply span of real plane (in feet) by scale in column A. Answer is span of model in inches. The first and most heart-searching problem that a scale modeler encounters when engaging upon a new project is the apparently simple one of choosing his subject. I'm sure we all know from personal experience exactly how "simple" a job this is. I cannot give a fool-proof method of overcoming this problem. The fact is that I have just as much trouble as anyone else in this regard. But what I can do is help a little by saving some time and fruitless work in the step immediately following the choice of subject - the critical matter of what size or scale the model shall be built to. Bearing on this are such factors as airfoils, all-up weight, amount of detailing, and type of aircraft. The most vital dimension of any model is its wing area. Wing span, of itself, does not matter but results inevitably from the area chosen. Having chosen a suitable wing area bracket for our model, based upon the intended purpose or class of scale model we want, the specific question is: To what scale must the model be built to give an area closest to our requirements? The table will give the answer to this important question in a few moments, and without any drawing or measurement of the scale plan. We need to know only two figures: the wing span and the wing area of our subject full-size airplane. Let's take a couple of examples to show how the table works. The simplicity of the scheme will be evident. Case 1: Joe decides to make a P-47 Thunderbolt for full-house propo R/C. A suitable wing area for this model will fall in the 600-750 sq. ins. bracket. The wing span and area of the P-47 are 40' 9" and 300 sq. ft. respectively. By looking at the table, we find that the area of a 1 1/2" = 1' (1/8 full-size) model will be 300 x 2.25 = 675 sq. ins. Not bad for a first attempt! Span will be 40.75 x 1.5 = 61 1/8". For this model, Joe can either enlarge a 1/72 drawing by 9 or 1 1/48 drawing by 6, as the table shows. Case 2: Bill wants a F.W. 190 for his 45 engine to fly C/L. A ball-park area here would be around 300 sq. ins. From the area of the full-size airplane (197 sq. ft.), Bill sees that a good scale will be 1 1/4" = 1', giving a wing area of 197 x 1.56 = 307 sq. ins. Span here gets to be 34.5 (span in feet of real F.W.) x 1.25 = 43 1/8". For an even enlargement of a scale drawing, the table tells Bill that he'll need a 1/48 scale drawing to multiply by 5. So, we see that given this table, a whole lot of measuring and drawing of unsuitable size plans is saved. The scope of the table goes from 1" x 1' to 2" = 1' which is where 99 out of 100 scale models fall, and is graduated in many steps to allow very accurate area-requirements to be met almost exactly. Finally, I wonder if I can hope that some modeler (much cleverer than me) will give us a simple table for choosing our subject!